Aquatics programming offers Scuba, AquaSport, Swim N' Splash, and High Performance Camps. The Advanced Scuba Camp is for individuals who have taken the basic UBC Scuba Camp or have previous Scuba Diving experience. It provides campers with the opportunity to focus on their deep water scuba diving skills, while participating in activities with other divers in the new UBC Aquatic Centre. 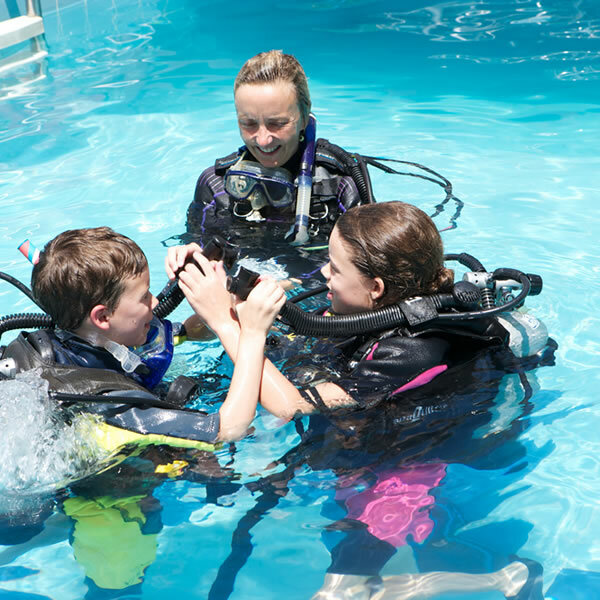 The scuba diving techniques will emphasize the physics, physiology and equipment of diving beyond the skills learned in the basic UBC Scuba Camp. No swim lesson is included in the program. Medical Screening Questionnaire needs to be completed before the first day of the course. If registration was done over the phone or in-person, please also fill out the UBC Aquatics Consent Form found here. The Swim N’ Splash camp provides campers with the opportunity to engage in water activities that enhance movement skills, teamwork and sportsmanship at the new UBC Aquatic Centre. Engage in activities in and out of the water that encourage and support preschoolers' cognitive, emotional and creative skills. The Red Cross Babysitter Training Camp will offer certification, training and instruction in childcare and first aid for babies, toddlers and school-aged children. Participants will learn key scuba diving techniques and have the opportunity to test their newly acquired skills by free underwater swim time in the new UBC Aquatic Centre. Campers will engage in activities that enhance physical literacy skills pertaining to ball-handling, passing, shooting, goal-tending, as well as teamwork, sportsmanship and game strategies. Try out various water sports in a fair and safe aquatic environment at the new UBC Aquatic Centre. Aquatic Adventures combines kayak instruction at Jericho Beach with water-themed activities around the city. Swim camp without the swim lesson! Campers will have two hours of organized games, activities and fun; boat and swim races, tarzan ropes, obstacle courses, diving contests and underwater treasure hunts! Entry-level competitive swimming program designed for swimmers proficient in their strokes (Freestyle, Backstroke, Breaststroke). Campers should have completed Swim Kids 8 or higher. Enjoy a day whizzing down the waterslides at Big Splash, and another day relaxing at the beach. This camp is designed for those wishing to enjoy all the water-based fun that summer has to offer! Our program will provide young swimmers with the opportunity to learn basic synchronized swimming skills which will be incorporated into a creative dynamic routine to music. UBC Performance Swim Camp will include technical aspects of stroke mechanics and drills for all strokes, dives, starts and turns.